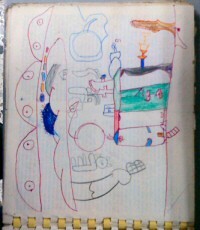 The picture is a wonderful kid’s drawing scribbled on the pages of the sole book on scientific psychology in Medell√≠n’s centre for Lacanian psychoanalysis. Jacques Lacan was a French psychiatrist who created his own branch of psychoanalysis through an extended post-modernist riff on Freud. I recently discovered I live in a barrio once famous for being the centre of psychoanlaysis in the city, and after some searching, found one of the parts still going strong is the presence of the centre for Lacanian analysis. While browsing through the library I discovered a battered photocopy of a book by Hans Eysenck, the late psychologist from the Institute of Psychiatry in London known for his vehement opposition to all things Freudian. The photocopy is a translation of the 1971 book he wrote called ‘Psychology is About People’ although the title in Spanish is rather more polemic: ‘La Rata o el Div√°n’ – The Rat or the Couch! On the back of virtually every page, it seems a child has decided to add their own artistic contributions, presumably while the analyst who borrowed the book was distracted. Which, psychoanalytically speaking, is very telling.